VietNamNet Bridge - Laos is set to move forward to build Pak Beng hydropower dam on Mekong mainstream, but technical reports about the project still do not provide adequate information. Vietnamese Minister of Natural Resources and the Environment and Chair of the Vietnam Mekong River Commission, Tran Hong Ha, on May 12 chaired a workshop on the building of the Lao Pak Beng hydropower project on the Mekong - a controversial Laos project. Ha emphasized that the reports about the project shown in the latest round of consultation showed inadequate information and outdated data. There was no assessment about the relations between Pak Beng and the other 10 dams in the mainstream in Laos and other dams in China. There was no assessment about the impact between climate change and cross-border issues. Regarding the assessments on the possible impact on the environment in seven related fields (hydrography; silt - sediment; water quality - aquatic ecology; fisheries; socio-economic development; water transportation; and dam safety), the reports gave old figures and these were just estimates, not exact figures. 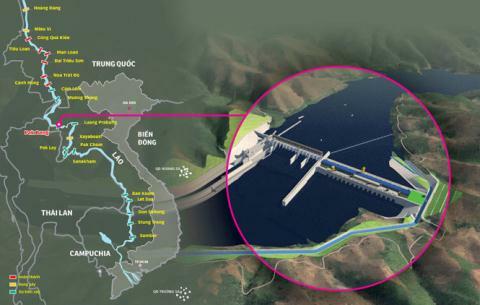 Pak Beng is the third hydropower project in a series of 11 hydropower projects Laos plans to build on Mekong mainstream. The other two, Xazaburi and Don Shahong, are under construction despite protests from the international community. Though the compulsory consultation process has not finished, the investor has begun building some support works to serve dam construction. Le Anh Tuan from Can Tho University said it was necessary to postpone implementation of the project until there is more scientific assessment. Tuan said the technical report of the project was made by a Chinese company which used figures from the 1960-1970s. Meanwhile, the six hydropower dams built by China on Mekong mainstream have led to complete changes of the hydrography-hydraulic characteristics of the middle and lower courses of Mekong. Tuoi Tre quoted an expert as saying that Pak Beng hydropower project is built based on Chinese standards. Meanwhile, it is necessary to pursue international standards when designing the plant. Nguyen Ngoc Tran, former chair of the National Assembly’s Committee for Science & Technology, warned that Vietnam’s Mekong Delta is suffering from landslides because of the decrease in the sediment. He said the consequences will be more serious if Laos builds one more hydroelectric dam. If Laos builds hydropower plants on Mekong mainstream without reports on the possible impact on the environment in the short, medium and long term, the impact on Vietnam’s Mekong Delta will be unpredictable. Nguyen Huu Thien, an independent researcher, cited a series of landslide cases recently, in which houses fell into Hau River in An Giang province, to illustrate his argument about the possible impact on the environment after the loss of sediment.